Some common or at least familiar units - APL and MRA, but in almost 30 years of being in the region and collecting I have never seen the KAC or WTG issues. The latter naming has been partially obscured but nonetheless I am happy to give it a home. Any suggestions as to what the rank may be? Corporal? Usually the rank designation on the Tribal Guards issue is T.G. (Tribal Guard). How Gay's GSM for 'Cyprus' ended up in the lot is a mystery - possibly stolen when he was based in Aden? If this is the case and he qualified for the 'Arabian Peninsula' clasp, would it have been issued on an official replacement? If so and this can be substantiated perhaps I should add an 'Arabian Peninsula' clasp? Congrats on a wonderful acquisition. I look forward to reading more on what the units did. That's a fine haul of GSM's from Yemen - and including some very exotic units = well done. Question: Is the ensemble a Jewellers window dressing lot (i.e. 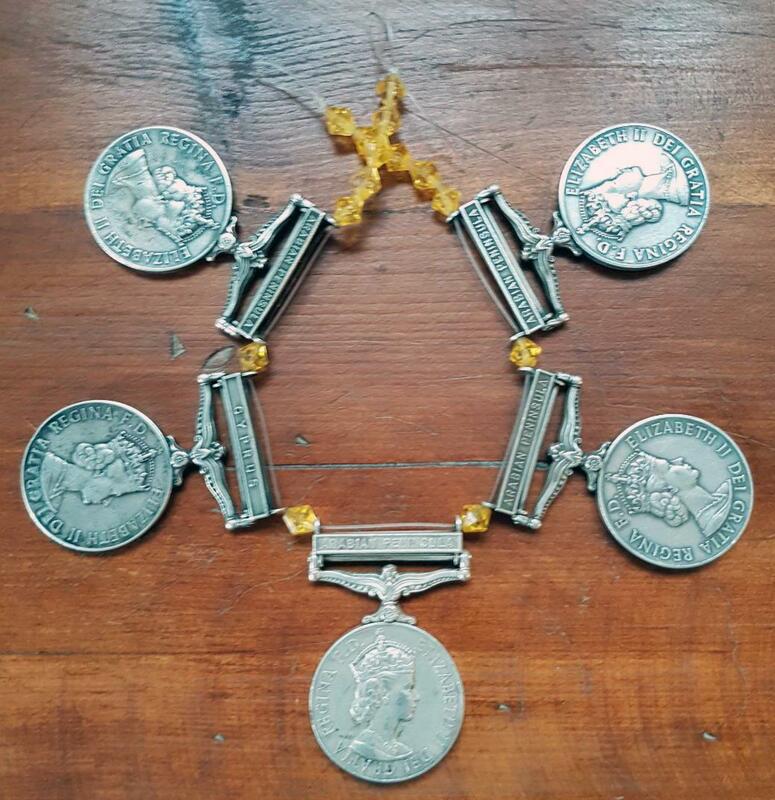 medals just strung together for show), or do you think the medals actually did adorn a local's neck at some time? I am pretty certain that your Britisher amongst the lot, is one DAVID J GAY, born 29 March 1926, the son of Alfred & Sarah Gay, who was residing with his parents (and 3 other siblings) at 33 Parkside, Wallasey Chesire, England, in April 1939. I gleaned that from a search of the '1939 National Register for England & Wales', and which contains NIL other D J Gay's who could possibly meet the birth/age criteria for a post-war British Army Gunner enlistee (unless someone was born subsequent in 1940/41) who served during the Cyprus emergency. Alas there is no similar source for Scotland / Northern Ireland - but on a good hunch I am pretty certain that the aforegiven is your man. I have not checked the above D J Gay for anything else, but 'assuming' it is your man, you should be able to build a picture from above. Good luck with the collecting. Many thanks for the information - always good to put some 'history' on a medal. i suspect the 'stringing' of the medals is indeed a marketing ploy although it may have been done some time ago - despite having being to Yemen many times I have not been since 2011 and since about then the tourist trade has been non-existent. Gay's medal is outside the scope of my collection and for the time being will go into the rainy day drawer.